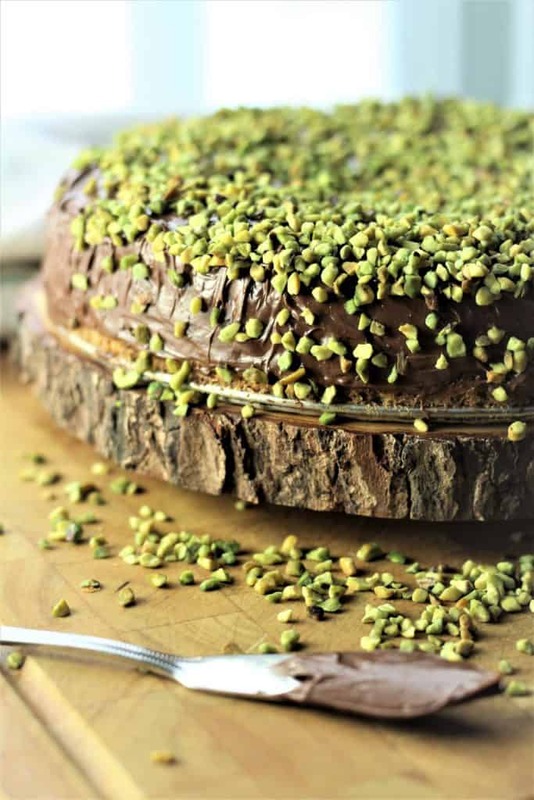 Sicilian Pistachio and Nutella Cake. What a beautiful way to showcase pistachios both inside and on top of the cake! 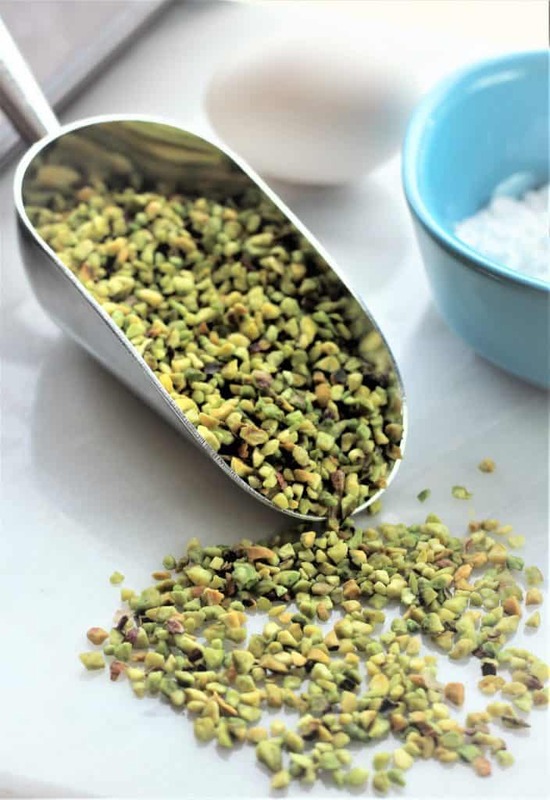 I’m so enjoying looking for ways to cook and bake with these pistachios from Sicily! Whether it’s in savory recipes such as Sicilian Veal Involtini, or sweets like Pistachio Amaretti I love how pistachios elevate these dishes to a whole new level adding both crunch and unexpected flavor. 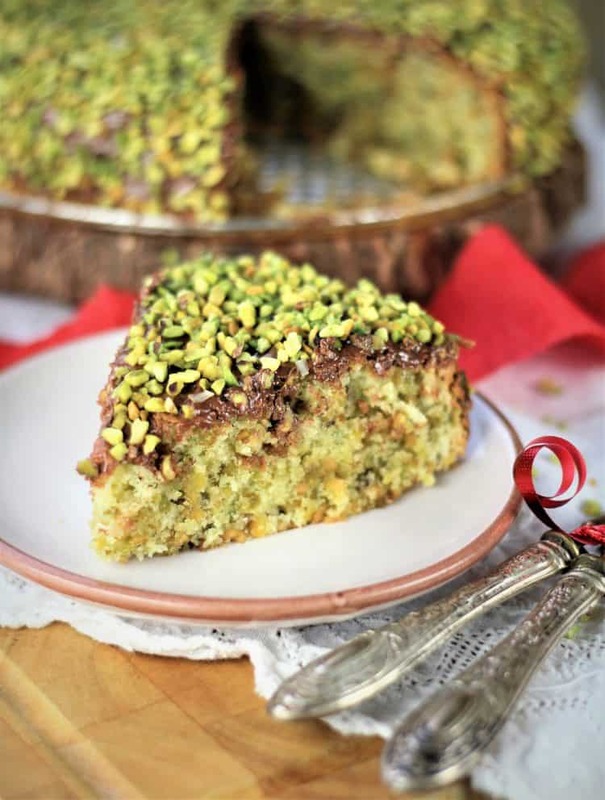 This Sicilian Pistachio and Nutella Cake does it again! Pistachios from Bronte, Sicily are like green gold. You’ll find an endless array of products made with these local pistachios all over in Sicily. I had the good fortune to bring back some of these from my most recent trip. This recipe comes from my dear cousin in Sicily. 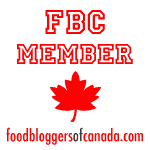 It was slightly adapted taking into consideration the availability of certain ingredients here in Canada. But before making this cake I had to decide whether it was worth using up all these pistachios! It contains pistachios both inside and on top of the cake. And most importantly my supply of Sicilian pistachios is slowly dwindling. Believe me, it was well worth it! What to do if you don’t have pistachios from Bronte, Sicily? Purchase whole shelled pistachios or with shells on if you don’t mind taking the time to shell them yourself. Make sure they are not roasted or salted. Salted pistachios will definitely affect the taste of your cake. Place in a plastic bag and crush using a rolling pin or flat side of a meat mallet. Another option would be to coarsely chop them with a sharp knife, but that will be a bit more time consuming! Do not grind in a food processor. 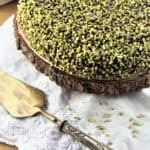 This cake uses crushed pistachios not pistachio flour. 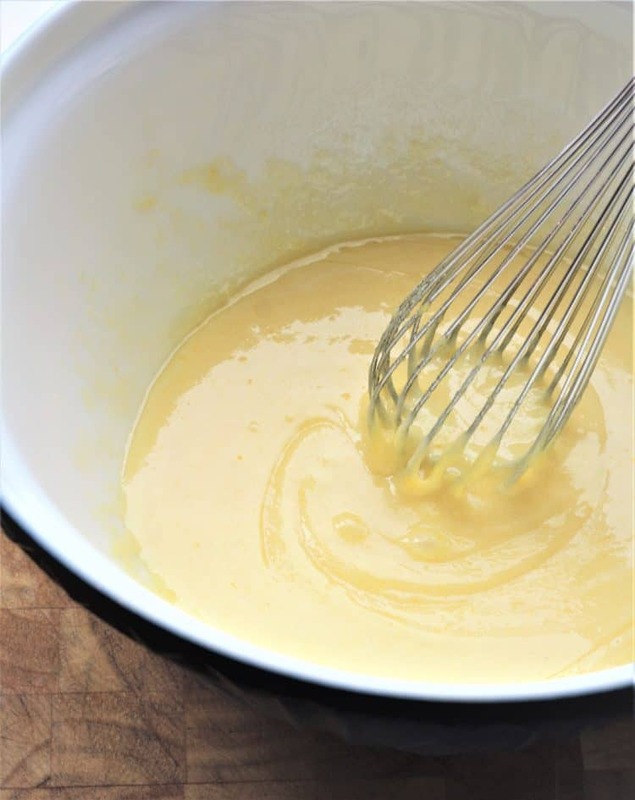 Begin by whisking the egg yolks and sugar. Add melted butter and vanilla and whisk. Sift flour and baking powder and stir into the egg mixture until combined. 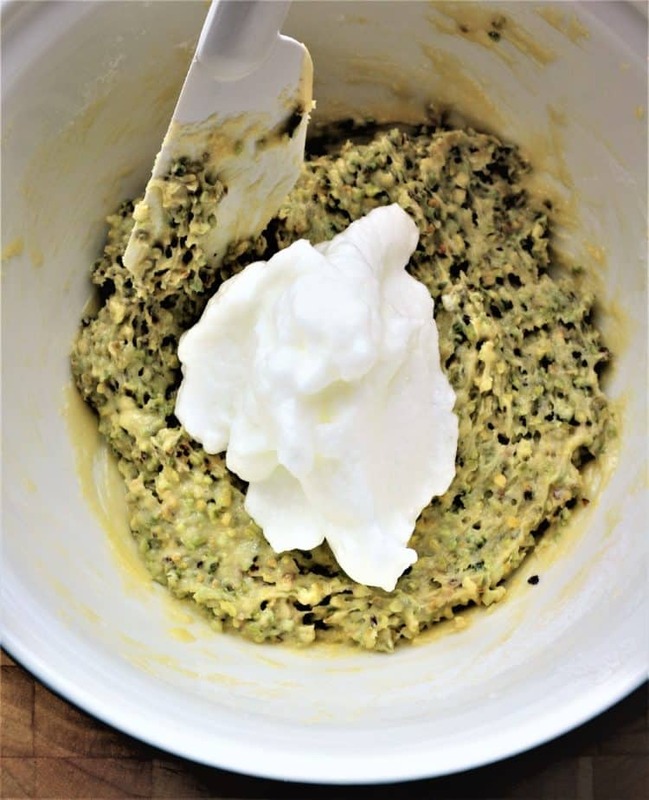 Stir in the crushed pistachios. Whisk the egg whites and gently fold them in the mixture. 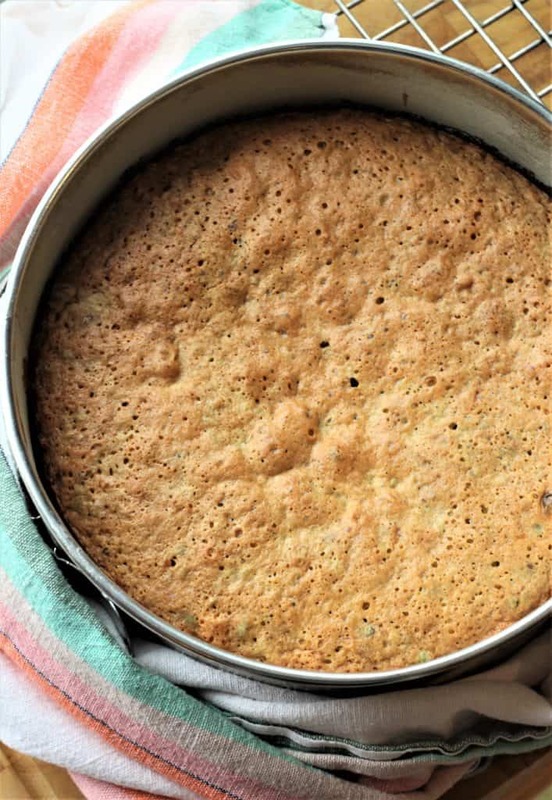 Pour into a greased and floured spring form pan. Bake at 350F for 45 minutes. Let cool for a few minutes before removing the sides of a pan. 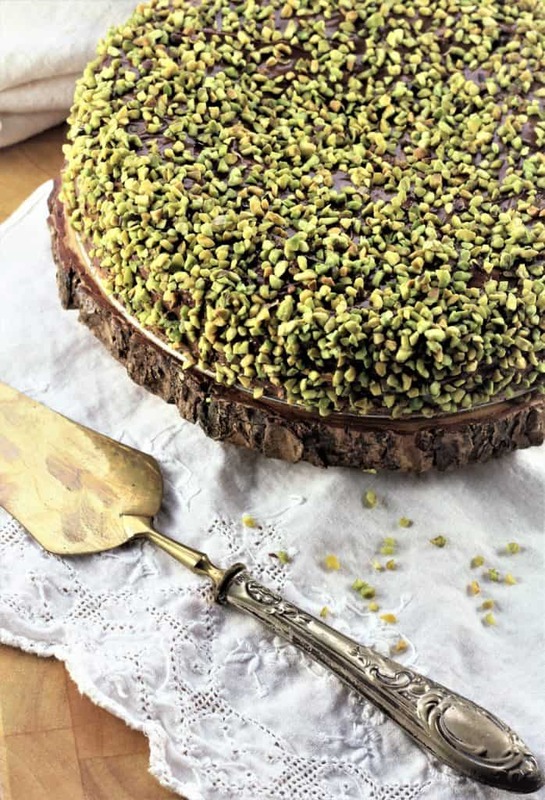 After the cake is cooled, spread Nutella over the top and sides and coat with crushed pistachios. That’s all there is to it to make this beautiful cake! It will keep well at room temperature for 3 days. Valentine’s Day is just around the corner and this would be the perfect cake to surprise your loved ones with! Show me your lovely photos of your Sicilian Pistachio and Nutella Cake by tagging me with #mangiabedda or @mangiabedda on Facebook or Instagram. Don’t forget to Pin this recipe as well! Buon appetito! 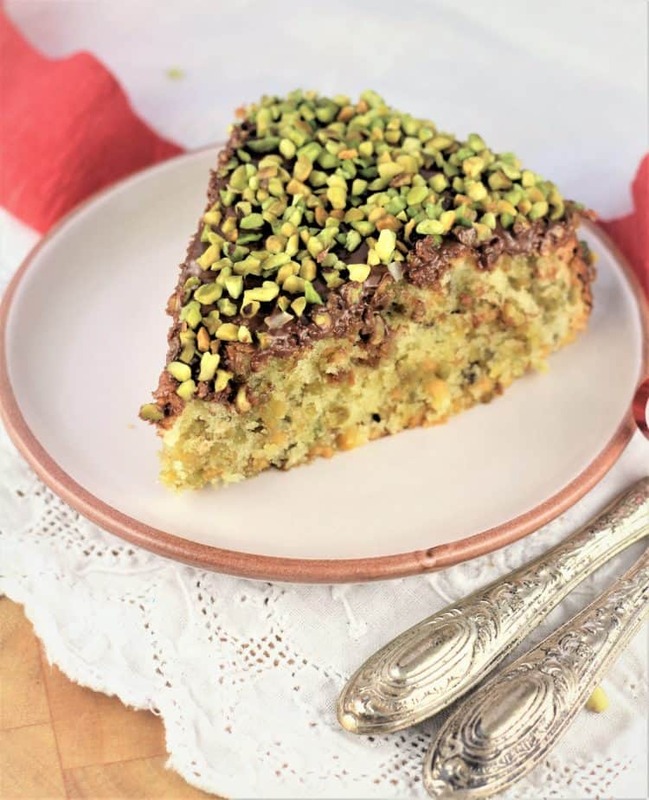 Sicilian Pistachio and Nutella Cake beautifully showcases pistachios both inside and on the cake. Preheat oven to 350F. Grease and flour a 9 inch spring form pan. 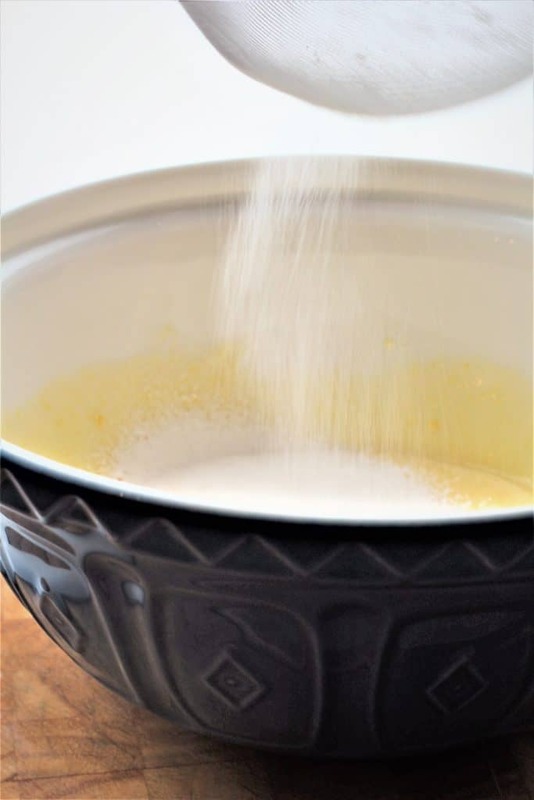 In a large bowl combine egg yolks and sugar. Whisk vigorously until the mixture forms ribbons when you lift the whisk. Add melted butter and vanilla. Mix well. Stir in sifted flour and baking powder and mix until just combined. Add the crushed pistachios and stir. 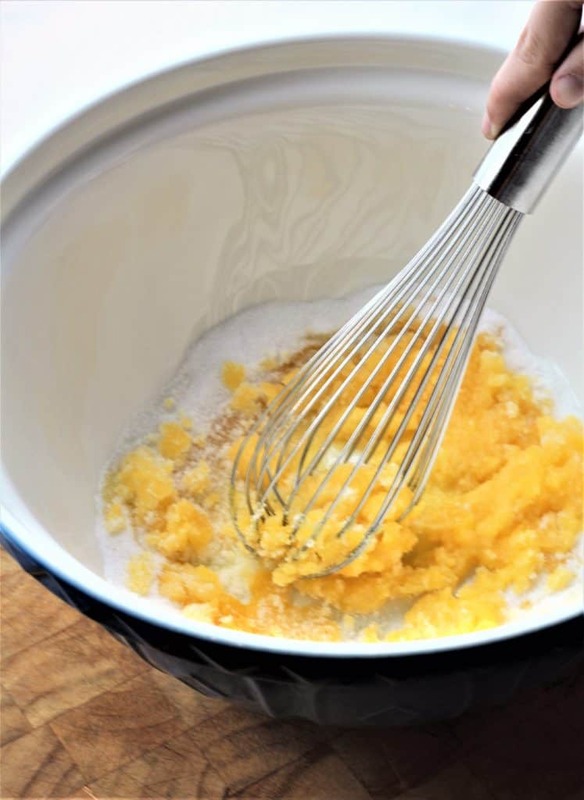 Using the whisk attachment of your stand mixer, beat egg whites until stiff. Fold half the egg whites into the batter with a spatula. Stir in the remaining egg whites until just combined. Pour the batter into the prepared pan and bake for 45 minutes. Remove from oven and let cool about 10 minutes before removing the sides of the pan. When the cake is cooled, use an off set spatula to cover the top and sides with Nutella. 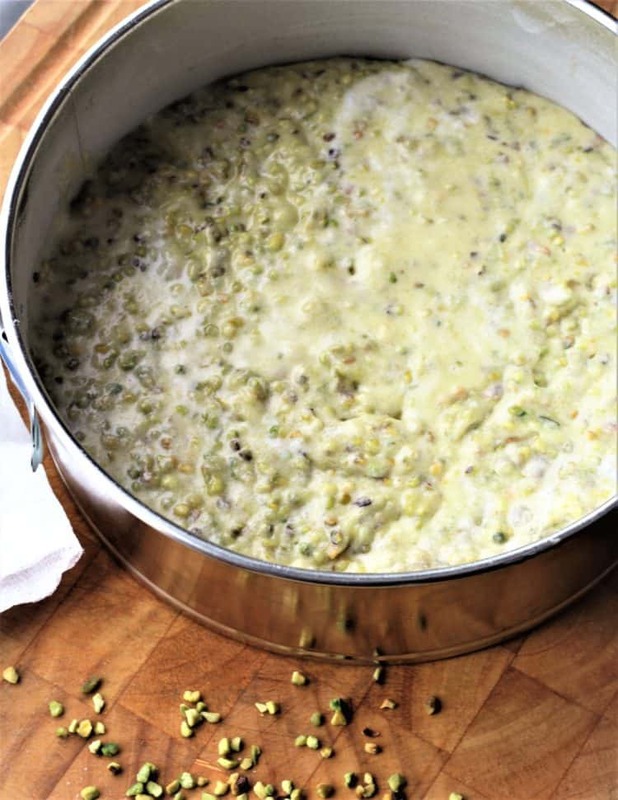 Sprinkle the top and sides of the cake with crushed pistachios. Purchase whole shelled pistachios or with shells on if you don't mind taking the time to shell them yourself. Place in a plastic bag and crush using a rolling pin or flat side of the meat mallet. Please note that the nutritional information provided is approximate and may vary according to the exact portion size. Nadia, I love this cake idea! Look amazing! Thanks for sharing it with us. I adore pistachios as well, especially if they’re from Sicily! Thanks for your comment and for stopping by my blog!